What happens when a whole country is required to be happy – by order of the King? They smile no matter the weather, no matter if dinner is good or bad, no matter if they fall down or have measles. Everyone laughs and looks pleased. Except that one day a little boy cries. And because he cannot be comforted, he is whisked off to the King for punishment. The King has the widest smile of all, and when the boy says he actually wants to be sad, the King is thunderstruck. Why? When the boy tells the king he is sad because his well-loved dog has died, the King cries, and the boy realises he has been wearing a happy mask and is not a happy King at all. He, too, had a beloved dog that died. 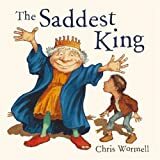 The boy and the King relate funny stories about their pets, and they cry a little: ‘Everybody needs to be sad sometimes’. The King tears up the compulsory order, and the whole country has a good cry. Good use is made of white space on the page, contrasting with richly coloured medieval peasant costume, and the detail in the drawings will be fun to point out and talk about. As a parable, this story expresses something everyone knows but sometimes needs to be reminded of.